Why pay ongoing fees for an EPOS? Not so long ago many pubs would rely on a mechanical till or basic Point of Sale (POS) system that involved an upfront payment and then nothing more. Now it’s becoming more common to purchase an Electronic Point of Sale (EPOS) via a monthly or annual license fee. So why the change, and what do you get for this ongoing cost? The rate of change of technology is faster now than ever before. Older pub EPOS systems and tills performed the basic functions of keying in orders and taking payments. The latest pub EPOS systems can email you on your business performance, monitor your staff hours, and post to your accounts. The potential features are so far-reaching and rapidly expanding that EPOS companies need a team of developers constantly working to enhance their offering. Without this, their systems would soon become obsolete. This constant development & improvement needs to be paid for and that is where license fees come in. Ongoing fees should also cover the support your business will need. Providing support, particularly for pubs & bars that trade late into the night, has a cost. And with pub EPOS systems now responsible for so many elements of your business it's important to be able to get help when you need it. So how do some companies not charge license fees? There are still systems available for which you pay for the software up front (though there is still likely to be an annual maintenance fee to cover support). This is still effectively a license fee, you are just paying it in one go, meaning you own the software. The advantage of this is you are free to use the software for as long as you like with no further cost to pay. The disadvantage is you are unlikely to get any significant upgrades or enhancements, at least not for free. Inevitably as technology moves on, the software will become out of date & no longer take advantage of the latest technology, or meet the evolving needs of your business. At this point, you will need to upgrade the system and purchase new software and most likely new hardware to run it. It is important to factor in these upgrade costs, as well as any ongoing maintenance when comparing ongoing license fee vs. upfront EPOS options. 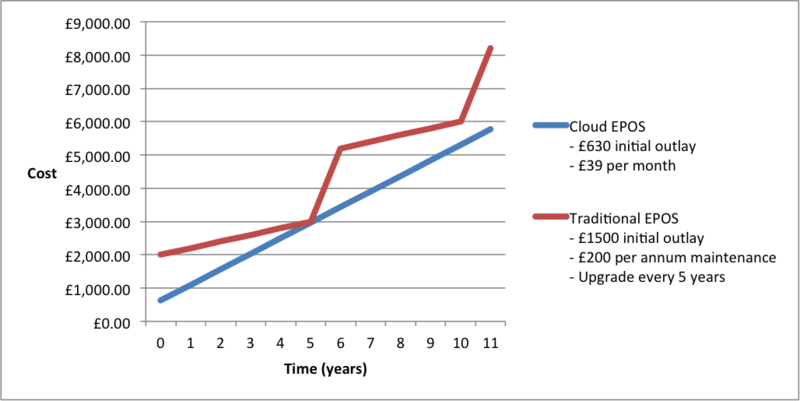 The below chart shows the cost over time of a typical cloud EPOS (using BarTab figures) vs. an upfront purchase system with a fairly typical maintenance fee and an upgrade every 5 years. The exact figures will vary, but the chart demonstrates how both types of system incur an ongoing investment. As the pace of change of technology increases, the frequency of requiring these upgrades is only likely to increase also. With an upfront purchase system, it is only immediately after an upgrade that you will have the very latest technology available. After that, the system becomes progressively more out of date until your next upgrade. With an ongoing license fee model, you should receive frequent releases and always be on the latest technology offered by the company. Isn’t some EPOS software free? There is some EPOS software that, on the surface at least, is free. Of course, all businesses need to cover their costs and with software as important to your business as an EPOS it is good to ask how any provider of free software plans to do this. You may find that premium features will be offered for a price at some point down the line, or you may be tied into higher card transaction fees. This can be cost-effective for very small, low volume businesses, but for the average pub can prove very costly. 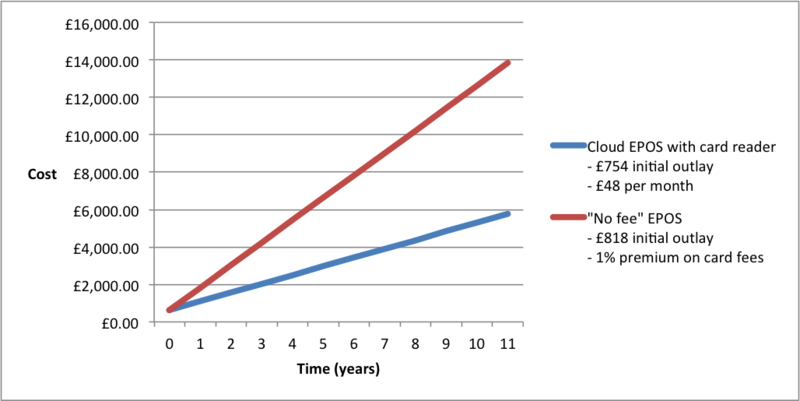 The graph below shows the cost of BarTab cloud EPOS vs a well known “no fee” alternative, for a venue taking a modest £10,000 in card payments per month. This shows just one specific example, but it demonstrates the importance of checking the true cost of a “no fee” solution. With any free software check the support commitment from the provider. Support has a cost so with any free software (without significant hidden costs) this is likely to be limited. You are also unlikely to get any customisations with a free solution – again these have a cost attached that need to be covered. If you run a very simple operation and can afford to wait for responses to issues or questions then a no fee solution might work for you. If you rely on rapid support or have particular requirements you need to be met, then you will likely need to look for a paid solution. The right type of system for you will depend on the specifics of your business. With upfront purchase systems be realistic about when you might need to upgrade and what the costs will be so you can factor this in. For simple, low volume businesses, no fee systems could prove cost-effective. Just make sure you check for any hidden costs and that you will have the support you need. With ongoing license fee systems, make sure that your fee includes all of your support as well as any new software releases and enhancements. With BarTab EPOS your license fee includes all software updates and enhancements as well as industry-leading support. To learn more about BarTab, contact one of our team or start a free 14-day trial.